Could someone direct me to the potential sources to find the Shapefiles of farm resource regions? but I have had a hard time finding the Shapefiles. 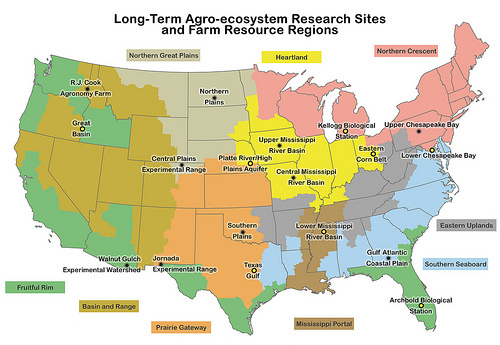 Is a "land resource region" the same as a "farm resource region"? To actually download both datasets, Data.gov re-directs you to the main page of the USDA Geospatial Data Gateway. In the bottom-right corner of this page, you'll see a box that says "I want to..." with links to different ways to download data. Through the interactive map, you can download "Common Resource Areas by State." There's no way to preview the data, so I couldn't tell for sure if this is the data you wanted. Since it's divided by state anyway, I suggest downloading a single state and loading it into your GIS to make sure it's what you want before you download all 50 states. Look here under "U.S. Farm Resource Regions" you can get an excel file with all of the regions appended to the FIPS code. Not the answer you're looking for? Browse other questions tagged data united-states or ask your own question. Seeking USA electric transmission powerlines as shapefiles? Seeking Mississippi Township Range Section shapefiles? Obtaining Postcode Boundaries for India? 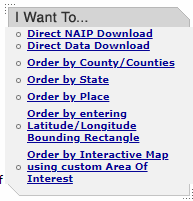 Seeking USA CLU shapefiles for agricultural land? Seeking US Highway exits shapefile?